Six men were killed and five are in serious condition after an attack on Quebec City’s main Mosque. According to Radio-Canada, the French-language CBC, there is one suspect, but we are at an early point in the investigation. Women and children were not killed as they do not worship in the same room as men. The Mosque had been vandalized earlier when a pig’s head was deposited at the door of the building. Motivation has yet to be determined with precision, but the target was a Mosque, the most important Mosque in Quebec city. Prime Minister Justin Trudeau is travelling to Quebec city with the interim leader of the opposition, Rona Ambrose. For information on Islamic facilities in Quebec City, please click on the following link. I would not blame President Trump, but I hope he will soon realize that Islamophobia is putting Muslims at considerable risk around the world. 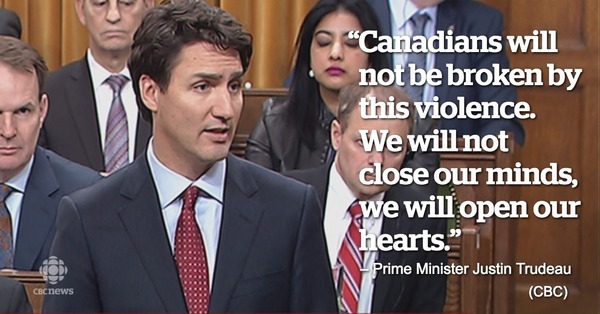 I hope he will also realize that Canadians were attacked. Canada is endangered because it welcomes Muslims and is located immediately north of the United States. He must reverse his stand on immigration or poison the mind of possible terrorists. If he dares suggest that terrorist attacks are to be expected in countries that welcome Muslim immigrants, he will hear differently. 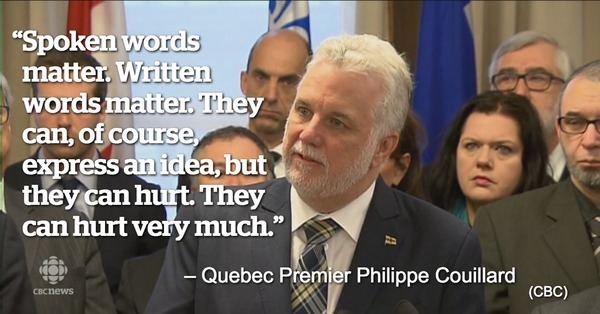 Meanwhile, we will have to intensify the protection of Canadian Muslims.